The Clifton Suspension Bridge celebrates 150 years! Whilst not on the main tourists routes, the Clifton Suspension Bridge is an incredible sight and this weekend reached its 150th birthday since it was opened in 1864. The bridge spans the Avon Gorge near Briston and is a remarkable sight either from on the bridge itself or from the river or road that runs beneath it. It was the brainchild of Isambard Kingdom Brunel, one of the many Victorian engineers that we owe so much too. 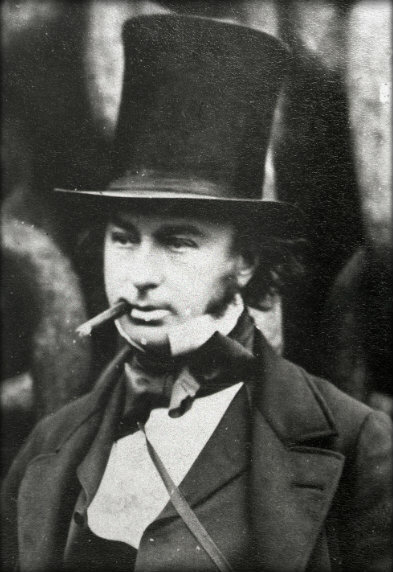 Brunel though was predominantly concerned with transportation. He built technically difficult tunnels under the Thames and his Great Western Railway involves numerous tunnels, bridges and viaducts and if that wasn’t enough he also designed train stations and steam ships. The fact that in the 2002 poll of the 100 Greatest Britons, he came in second only behind Sir Winston Churchill probably says all that needs to be said about the great man, in this post at least. 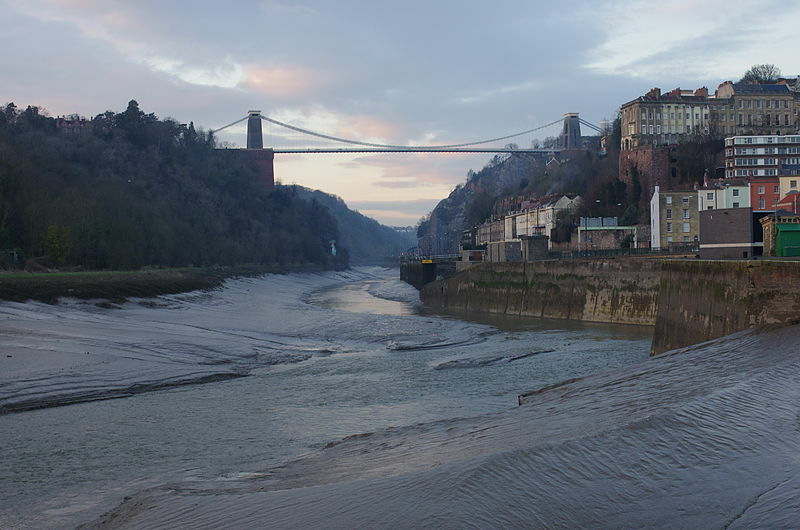 The original plans to span the Avon gorge originated in 1753 with a stone bridge but decades later it was Brunel who came up with the idea of building a wrought iron suspension bridge with two tall stone towers on each cliff edge from which large iron chains hang with their ends buried a into the hillside whilst the road itself is suspended from 81 rough iron rods. This technique also allowed even the tallest imaginable sailing ships to pass underneath, a pre-requisite from the Admiralty. 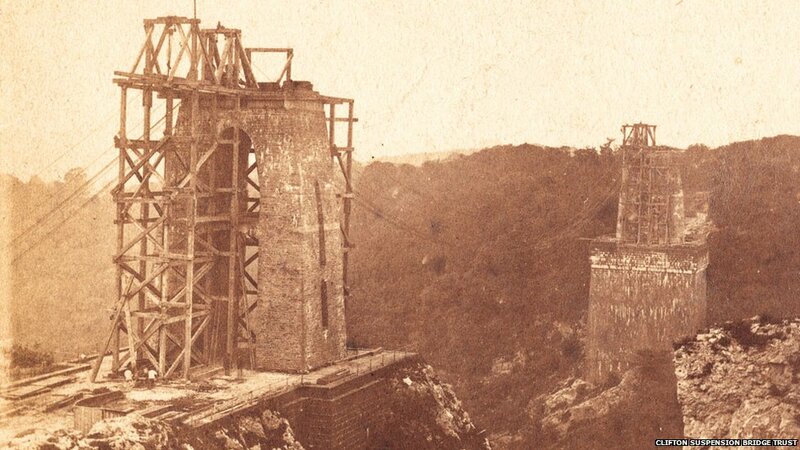 The Clifton Suspension Bridge under construction. The finished bridge was tested by spreading 500 tonnes of stone over its length and to the relief of all, the bridge sagged only 7 inches. Something that would have pleased Brunel no-end if only the heavy smoking genius hadn’t died before its completion. The bridge is 245ft (75m) above the water and has a total length of 1,352 ft or 412 metres and each year sees over 4 million cars travel across it. Aside from travel, it has also seen various historic moments including the Olympic Torch passing over it in 2012 and the final Concorde flight passing under it in 2003. The very first modern-style Bungee jumps took place from the bridge too. In fact the bridge is a well known suicide spot and historically around 8 people a year have jumped to their deaths there although this number has now reduced due to high barriers being put in place and the telephone number of the Samaritans displayed prominently. One of those lucky few who survived was Sarah Ann Henley who have been jilted by her beau in 1885 and at the young age of 22 jumped from the bridge. She was found injured but alive in deep mud. I often tell people on my tours of London how ladies would be saved from their suicide jumps from Tower Bridge by their long dresses billowing out much like a parachute and this is what saved Sarah’s life. Happily she made a full recovery and lived until she was 85. The bridge is a well known landmark and a new visitors centre is opening up as now only are the views stunning but the bridge itself is incredible to behold. The 150th anniversary was celebrated tens of thousands of people (some estimates 100,000) who saw a firework display which lit up the bridge and the gorge. The celebrations were foreshadowed by a minutes silence for Charlotte Bevan and her 4 day old daughter Zaani Tiana who were found dead on the gorge cliffs a few days earlier. A collection was held at the 150th anniversary with the proceeds going to the family of the deceased. This entry was posted in Heritage, history, Science and Engineering, Travel, Ye Olde England Tours and tagged Avon Gorge, Bridges, Bristol, Clifton Suspension Bridge, engineering, history, Isambard Kingdom Brunel, Life, Sightseeing, Travel, Ye Olde England Tours. Bookmark the permalink. 3 Responses to The Clifton Suspension Bridge celebrates 150 years! My now old schoolmaster Brian Worthington is chair of the Clifton Residents’ society which has done much to preserve the beauties of this part of the blog. A great read! Always interesting and informative, Stephen. Thank you.